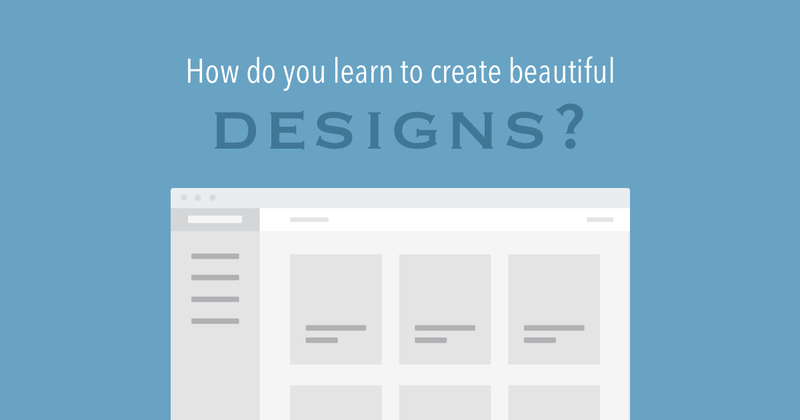 How do you learn web design? Whether you want to be a web designer or you simply want to know how to design beautiful interfaces, this article is for you. Maybe you want your beautiful designs to make you money. Or you simply want them to convey and portray you or your company in the right light. The problem is you're not sure what you need to learn or where to start. You're also worried about where you're going to "get inspiration" for all your designs. What books you should read, which YouTube videos you should watch, which audio books you should you listen to, and which designers you should follow? To answer your question we need to go back to October 02, 2014. On that day I published a blog post titled I'm not a designer. When I wrote that post I truly did not believe myself to be a designer. Let me walk you through what I did leading up to that blog post. It was really simple. One thing actually. Starting in 2007 I began designing web apps and websites (as a freelancer and also for myself). Yes, you read that right. I didn't know how to design but I just started. For those 7 years - from 2007 to 2014 - I designed something almost every single day. I still do this to this day. Here's the amazing part. Looking back over the projects I did and work that I completed I saw a slow, gradual improvement. I was getting better with each design. Not only was I getting better, I was starting to notice design trends and simple tricks to apply to all designs. And the biggest realization of all was that designing was becoming easier and easier the more I did it. What was at first was hard for me, now was now effortless. And I was much faster. A few months after that post was published I took a job as a Product Designer. I didn't apply for the job. They came to me. I wasn't even sure I wanted the job at first. And it wasn't an entry level design job either. It was for the Lead Product Designer position at a really great company. And guess what? I was only hired because they saw my designs. They saw what I could do. Now maybe you don't want a design job. You just want to create beautiful designs consistently. I get it. Either way, the process for me was the same. I didn't start out by reading books about web design and I've honestly only read a few. And I'm a voracious reader, I just found that for me reading design books doesn't help me create beautiful designs. It doesn't help me improve that much. That holds true for audio books. And I've never watched YouTube videos except to teach me how to design something very, very specific. I simply designed something every single day even when I didn't feel like it. Sometimes I wasn't sure how to design something. So, I looked around for beautiful designs to give me ideas. I created a pinterest board that I needed for a long time to give me design ideas and direction. I also used dribbble. And I stole like an artist. So here's what I'm trying to say: Becoming a designer, or being able to create beautiful designs, is your choice. All you have to do is start with one small part of some interface on your current project. Start wherever. Just design something. You will find that you are learning more by doing design than by listening, reading, or thinking about design ever could teach you - especially as you first begin. As you get farther along, if you find that your reading, listening, or thinking about design doesn't actually impact your designing then stop. It's not helping. The quality of your design work is always the guage and should always be your focus. I challenge you to design something today. I don't care how big the thing is you choose to design. It can be a button. In fact, I encourage you to start small. Don't try to create the perfect design, whatever that is. Just try to improve on what you currently have. And continue improving. You may be like me when I first started and need to look at other high quality designs in order to get ideas on how to improve your design. If so, look around if you find it helps you. But, that's not the focus. Don't let it slow you down. Just design something. What's the worst that could happen? Maybe you design something absolutely hideous. That will still teach you so much about what not to do next time. And then you can take that design and improve it. You will learn so much this way! So, what are you going to design? Go do it now. Get access to my free courses, best articles, and tips once a week. Thanks for signing up, you rock! Now check your email to confirm your subscription. I won't send you spam, promise. If it ever feels that way you can unsubscribe at any time.